US demand for air conditioning equipment will rise 4.0% yearly through 2021. Unitary air conditioners are the most widely used type of air conditioning equipment in the US and accounted for 80% of all value sales in 2016. However, the need for supplemental room air conditioners will become limited, negatively impacting equipment sales. The residential market for air conditioning equipment is expected to outperform the commercial through 2021, though it will remain the smaller market due to the higher cooling requirements in commercial buildings. 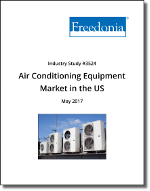 Demand for air conditioning equipment is examined by product type, market, and region in US dollars at the manufacturers’ level. Unit demand estimates are also provided by product and market. Historical data for 2006, 2011, and 2016 and forecasts to 2021 are presented in current dollars (which are not adjusted to account for inflation.